Lately I’ve been thinking a lot about how to work smoother in Photoshop. In that thought process, I have come up with five things that really helped me over time to work faster and more efficient. These tips are not rocket science, but merely a couple of tricks I use on a daily basis and found worthy of sharing. Press (T) » Edit text » Click on the move tool (V) since you can’t press (T) again » Edit another piece (T) » Repeat this cycle for as many times as you need. Why is it not possible to edit another text field by simply clicking on it? Well … it is! A colleague showed me a super simple solution — the enter key on the number pad. This key is like a “submit” button and when you press this after editing text, you can simply select another text field. Way more efficient, especially when you’re doing production work or dealing with multiple of layer compositions. 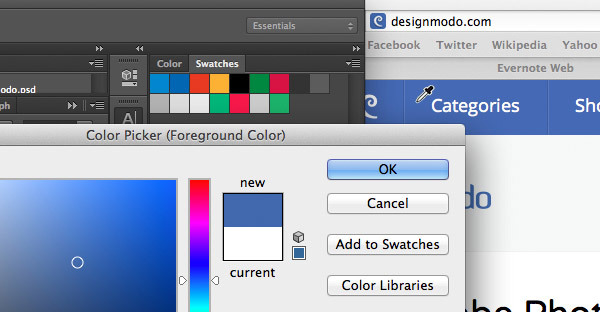 Did you know that you can select colors with the drop tool outside of the Photoshop application? It’s something that I first did by accident, but I’ve been using it ever since. How it works: Simply select a color with the drop tool wherever you want in your Photoshop document. Click to select, hold and simply drag the drop tool outside of your screen. Et voilà! Even though this worked, with responsiveness and easy adjustable Photoshop files in mind, I had to find another way. You can deselect an object by pressing ‘A’ followed by enter. Just like in the first tip, the layer will still be selected but the border is gone. Resizing is also easier. Just press ‘A’, click on the object and select the part you want to adjust. Unfortunately in this mode the object will have the selected border but, then again, you only have to press enter to determine if it’s perfect. I noticed this for the first time when I had to rasterize another image. Go to Edit » Keyboard Shortcuts (1) and a panel will pop up. As you can see in the image, you can apply a shortcut to every command available in the Photoshop menu (2) and it’s sorted in the exact same way, making navigation simple. Once you’ve applied a new shortcut, it might take a few days to get used to but fortunately the shortcut is shown in the same way as the default shortcuts. Each adjusted menu will show available options and corresponding keyboard shortcuts. Using the layer compositions tab is a feature that every web designer needs to know. I use it a lot to show different states of web pages. In the past I would just use the timeline and create different frames but layer compositions offer better support and flexibility. Go to Window » Layer Comps to show the menu (1). What you’ll see is a simple window with the possibilities to add more compositions. Click the Create New Layer Comp (2) button. Every new layer composition allows you to change the visibility, position and appearance of a layer. You could select different boxes for every layer comp but I generally select them all to make sure the proper effects are applied. That’s it! My five personal tips to make your life as a designer somewhat easier. Are there other tricks you use on a daily basis? Feel free to share your tips in the comment section below. I am a Web & App designer based in the Netherlands. Next to being a freelancer I also work on a full-time basis for Adidas Group. I love clean designs that make sense and are easy to use. More about me can be found on my Website, Twitter, Google+ or Dribbble profile. For the first tip, you can also use CTRL + Enter (CMD + Enter on Mac I guess). Francis unfortunately Esc won’t work since it won’t save the stuff you’ve edited. Hey Benjamin, Thanks for the tip! I think there are a lot of apple users who use the small wireless keyboard without the numpad so thanks for the useful comment. That’s awesome! I have a number pad when at my work station, but this has been bugging me for YEARS on my laptop keyboard. Esc works in CC, saves and exits the text field! I have had issues with Layer Comps in CS6. What has happened is that I make a layout, save a comp then make more layouts. But over time I needed to make changes to layer comps, sometimes deleting layers. After a while the layer comps were no longer saving the position of an element and I had wasted a lot of time fixing layouts for each layer comp. Adobe was not able to help me fix this issue so I had to abandon using this feature all together. Which is too bad because it had huge potential. I think the best usage of layer comps are the variations of a layout. Organize your work into separated folders and for each of them, create a comp for reveal and hide it. Let’s suppose you’re doing a wireframe of many pages for a clients. Just create a group for each page, put revelant layers inside and for each group, just create a layer comp. PS: when creating a layer comp for a group which is the page you’re working on, don’t forget to hide the visibility of other layers. Sarah, I experienced the same thing. That means we have to use this tool for the purpose I remember Photoshop creators told it was made for. It is supposed to help you do presentations to clients. In my case, I set my layers comps only when my document is final. So if I have modifications to do, it won’t be a big deal. Select the layers you want to group and hit Maj+Ctrl+Alt+the folder icon in the layer panel. A dial box appear and you can type the name of the group and eventually attach a color to it. I think it’s one thing crucial when working in PS: always keep your layers organized into folders and layer comps to show variations ;) . Even faster for grouping layers. I made my own shortcut. So I only need to do my shortcut, no need to hit Maj+Ctrl+Alt plus clic on folder icon in the layer panel. And the dial box appears too. 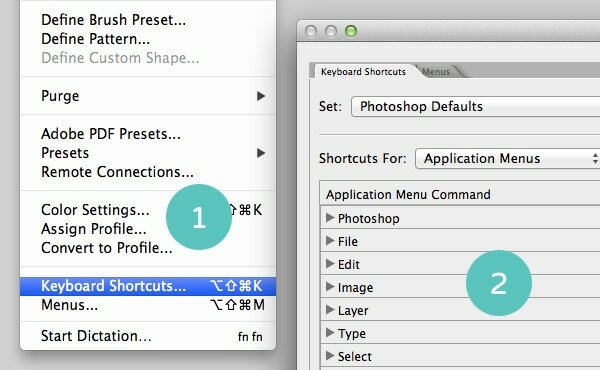 :) Just find the New group from selected layers in the shortcut Prefs and set your own. I fricken love CMD+J for multiplying a layer. wow! great tips and the comments too!! I only found out about layer comps the other week and already they are saving me hours of work. Especially when I have to show someone a few pages I’m working on, now I don’t need to search through layers turning them on and off, I can just select the comp! Stop Rasterizing Objects is useful!